*The provided shipping rates are applied for the 48 continental states only. Other residents, please contact us with full address prior to purchasing for shipping quote. The Deluxe Leather Pillow Top Adjustable Artist Concert Piano Bench is 23" long and 16.5" deep. It weighs about 32 pounds. Its height can be adjusted from 17" to 19.5". The artist concert piano bench is made of solid hard wood with heavy duty mechanism (silent micro adjustment). 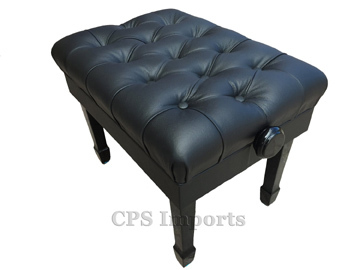 The cushioned top is covered with 100% premium genuine leather with extra thick padding. The leather we use on our bench is the top quality leather you can find. It's thick and soft. Each one is hand picked by our designers to ensure the quality of the leather you expect. The seat has a deep diamond tufted seat with 13 buttons for extra comfort. It also has solid skirt that covers the lifting mechanism. When the bench is adjusted to its maximum height, you do not see any gap or the lifting mechanisms. Quick and easy assembly, you just attach the legs with the wrench provided. Available in ebony (black) with high gloss or satin finish. This product carries a one-year limited warranty against defects in materials and workmanship. Copyright © 2017. CPS Imports. All Rights Reserved.